A Bichon Frise and Shih Tzu cross is known as a Shichon or Zuchon. They are cute, incredibly cuddly and playful hybrid dogs. If you are after a designer dog that will have everyone in the cafe giggling with delight, this is your pooch. These gorgeous little pets are very small, cute and have fluffy fur. Shichon/Zuchon’s are one of the most commonly recognized teddy bear dogs, They are what most people think of when a teddy bear dog comes to mind. Below I will refer to them as Zuchons but either terminology is fine. Shichons or Zuchons are a designer dog meaning that they are a mix of two other breeds. They are a cross between the Mediterranean Bichon Frise and the oriental Shih Tzu. It is a relatively new breed but it has become incredibly popular in such a short period of time. The Zuchon is not an official breed - it is only a cross-breed. If this type of dog’s popularity keeps growing it may well become an official breed. 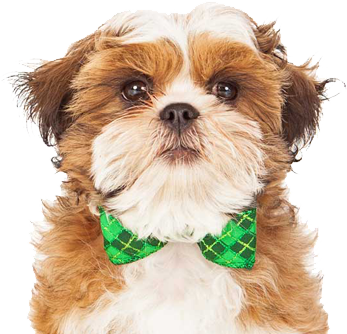 The two names (Shichon or Zuchon) are a combination of two breed names - Shih Tzu and Bichon Frise. It has a hybrid’s vigor and generally better health than their purebred ancestors. The Zuchon has a fluffy coat which can come in different colors, such as silver, white, black, grey, cream tan, red, apricot, chocolate brown or a combination of these. Their fur is soft and long-flowing and may be silky or curly. They don’t shed their hair either! Zuchons require brushing few times a week because of their long fur. Their maintenance cost can be low if the owner decides to keep the dog’s fur in a teddy bear cut. These dogs have a great personality with a big heart that defies their petite size. Zuchons are well-mannered, lively and playful. Sometimes they can show stubbornness, but with proper training this can be controlled. They like to bark but this can also be controlled with training.which they accept easily. Zuchons have good manners and are usually happy, gentle and social. They require attention, but return it back to their families in spades. They also don’t like to be left alone. They can be good therapy dogs and want to be active. Zuchons get along with other pets and with children if they are introduced in a good way. They can be good watch dogs - if there is a danger they will bark to alert their owner. The average height of a Zuchon is from 9 to 12 inches. They weigh approximately from 8 to 25 pounds (3.6 to 11.3 kgs) when they are fully grown. They are recognized by their large eyes, soft coat and endearing face. Great news - this hybrid breed is known for its longevity! They generally live from 12 to 15 years. They have good health and don’t show congenital defects. However, given that we are still experiencing the early generations of this breed of dog, results will be more certain in the future. When Zuchons grow their health issues may increase. Similar to other designer teddy bear dogs, they may have experience issues with epilepsy, deafness, liver disease and canine hip dysplasia. These dogs are also known as Shichon or fuzzy wuzzy puppy. They are so cute and loveable (which is obviously not unique but they really are!!). They have a longer coat and don’t shed hair. They are hypoallergenic dogs and are suitable for literally any family.